Hello my lovelies!! I'm in a mood for pretty today, so I'm going to talk flower pins. Oh how I love me a pretty little posy. I'm not going to tell you how to make these babies, because darling Emily over at Jones Design Company did a wonderful tutorial on how to make them a while back and I just can't improve on it, so I'm going to link to it instead. I am going to say, however, that most of the time I see these flowers with 3 or 4 circles, but I like them to be really full, so I use 7 or 8 (occasionally more). Other than that, I follow her process exactly. Unless you take this little cutie into account. I found that if I held each section of the circles over the flame, they would pucker up all over. And I think they make cute (and unique) flowers this way as well. ...to a pillow....to a hat. Makes you want to make some pretty flowers too, doesn't it? So cute. I love them full like that. I think I'll make a few in the morning! Thanks for the mention and i'm so glad you are enjoying the flowers. So pretty! I love them as a bib necklace. So pretty! I love the ones you embellished the white T with. How cute. Your daughter is absolutely gorgeous!! I make them full too, lots of layers and they end up looking like peony's, so lovely! Thanks for sharing! Thank you for the link to the tutorial, been trying these for ages, so cute! So pretty! 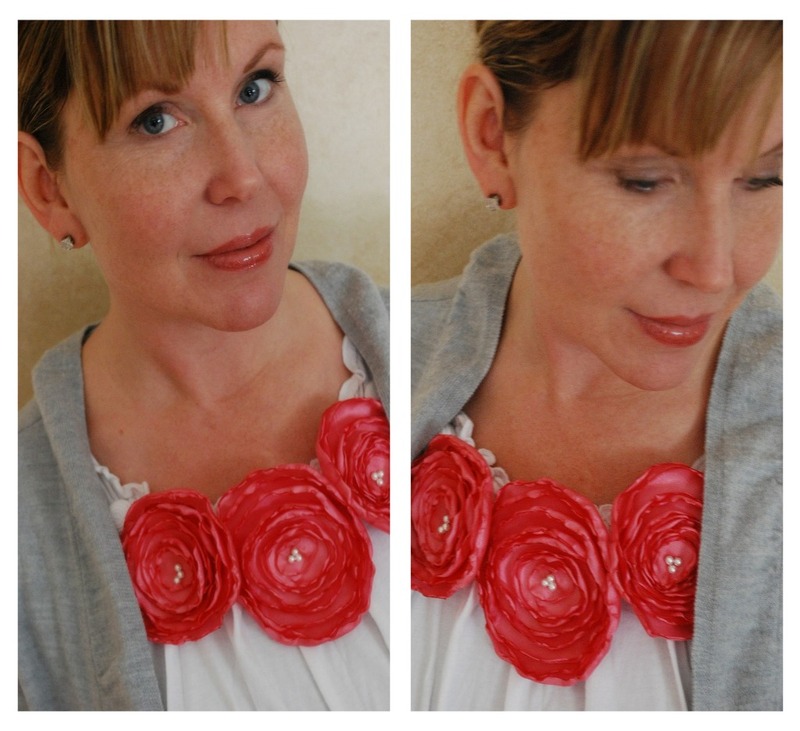 The look great along your neckline! Yes i do want to make some now!!!! !